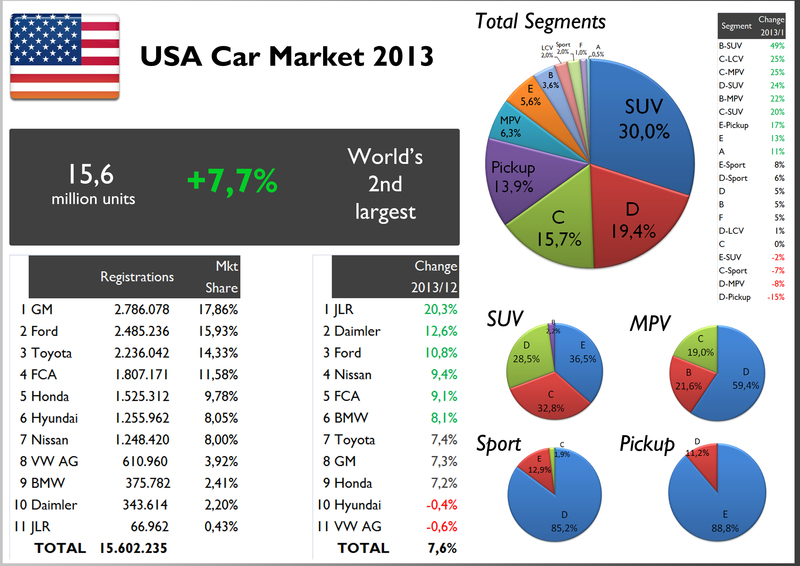 Here there are the main insights regarding USA car market and the FCA performance during 2013. This market was the world’s second largest and the most important for FCA. Thanks to strong rebates, better economic conditions and a better offer, Americans are buying cars again. US car market registered the best result since 2007 with 15,6 million units, up almost 8%. Once again it occupied the second position in world ranking, behind China and ahead of Japan, Brazil and Germany. Even if GM leads, the market is quite balanced among major car makers. The 6 largest car makers counted for 77% of total market. Ford, Nissan and FCA were the major car makers to post positive growths during 2013. VW and Hyundai-Kia were in the opposite side. Americans continue to buy SUVs. As it happens in Europe, small SUV is the best performer in terms of growth. Large MPVs and SUVs didn’t do that well. 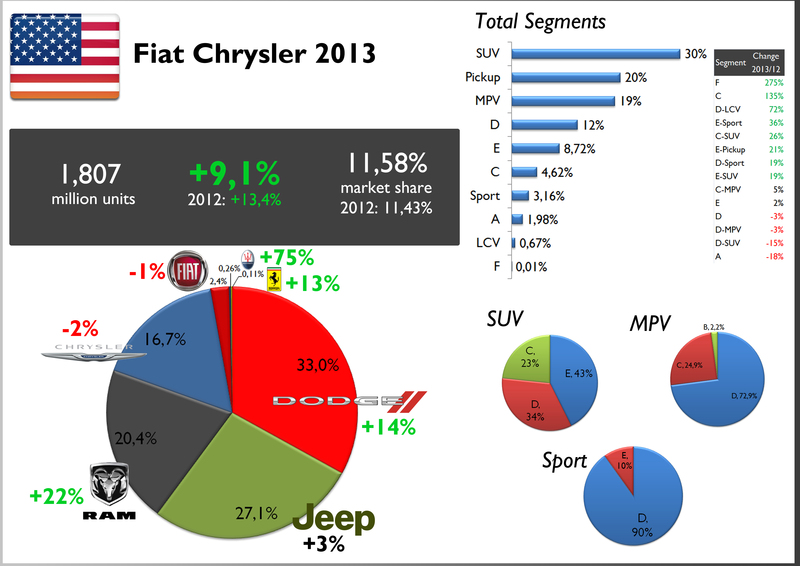 USA was FCA’s largest market, counting for 41% of its global registrations. USA’s share on FCA global sales raised as it grew more rapidly (+9%) than FCA total sales (+5%). The good performance allowed the group to increase its market share by 0,15 basic points, thanks mostly to Dodge and RAM divisions. Jeep brand, which registered global record sales, increased its registrations by only 3% as the new Cherokee was available since November. Following the market’s trend, 30% of FCA sales corresponded to SUVs. It is also strong with the Pickups and MPVs, but the Passenger cars are quite behind in the ranking. Once again the Ram Pickup was FCA’s best-selling product (in USA and worldwide). It was also the major product with the highest positive growth compared to 2012 figures. 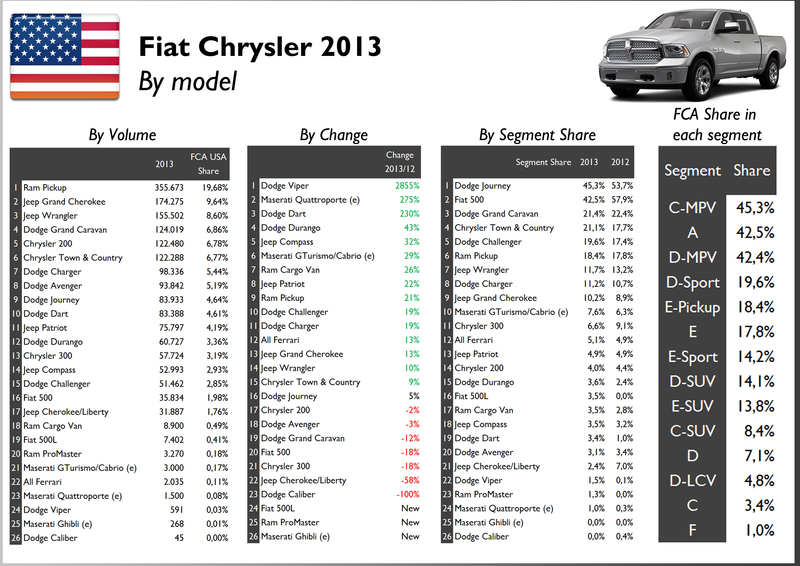 Thanks to its good demand, FCA was able to control 18,4% of the large pickup segment. Other big gainers were the Dodge Charger, Jeep Grand Cherokee and Wrangler and Chrysler Town & Country. The Chrysler 300 and the Dodge Grand Caravan were among the largest losers. Thanks to the Dodge Journey, FCA controls almost half of the C-MPV segment. The Fiat 500 comes second with 42,5% of A-Segment, but was down 8,4 basic points on 2012 results due to the arrival of the Chevrolet Spark. The group’s share in C and D segments is still low. Mid-size sedans continue to be American’s favorite car. 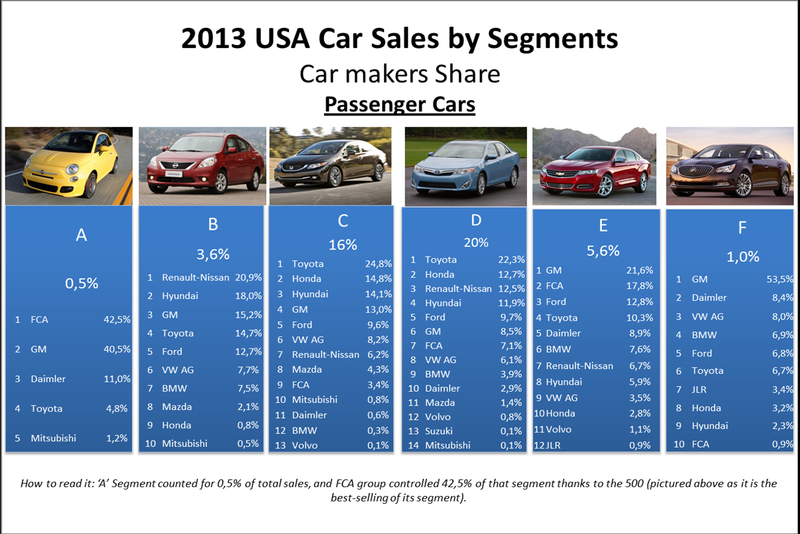 The C and D-Segments are clearly dominated by the Japanese car makers. Small cars are still quite unpopular, despite their big growth during the last 3 years. The 3 from Detroit control the E-segment thanks to their big sedans, quite ahead of the premium Germans. 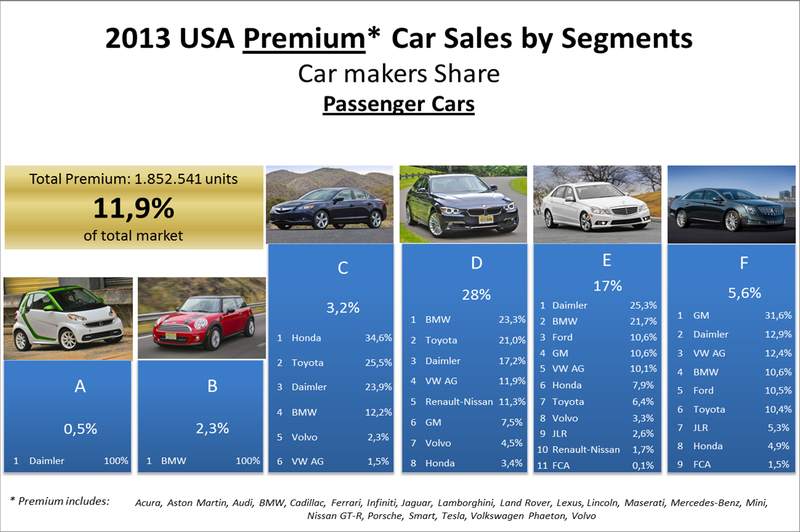 Notice that FCA isn’t present in the B-Segment and that VW AG sells more compact cars (C-Segment). Thanks to the Juke, Renault-Nissan dominates in the small SUV segment, right as it happens in Europe. However, this segment is still very small and is expected to grow in the mid-term thanks to the arrival of the Jeep Renegade, next year. 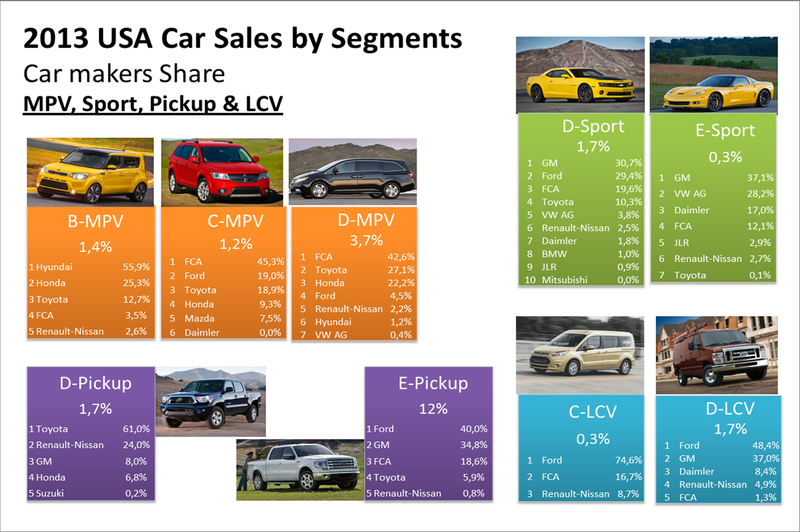 The compact segment of the SUVs is again dominated by Japanese with a very weak position from GM and FCA. The 3 from Detroit rule in the upper segments. FCA is the absolute leader in the MPV segment, which is becoming less popular. GM and Ford are out of this segment. Large pickups, which counts for 12% of total market was surely dominated by the Ford F-150. Notice the big gap there’s between the E and D-Pickup segments. The American muscle cars are the most popular sport cars in the US market. The strength of Toyota is mainly explained by its good position in the passenger car market. It more than doubles GM, in the second position. 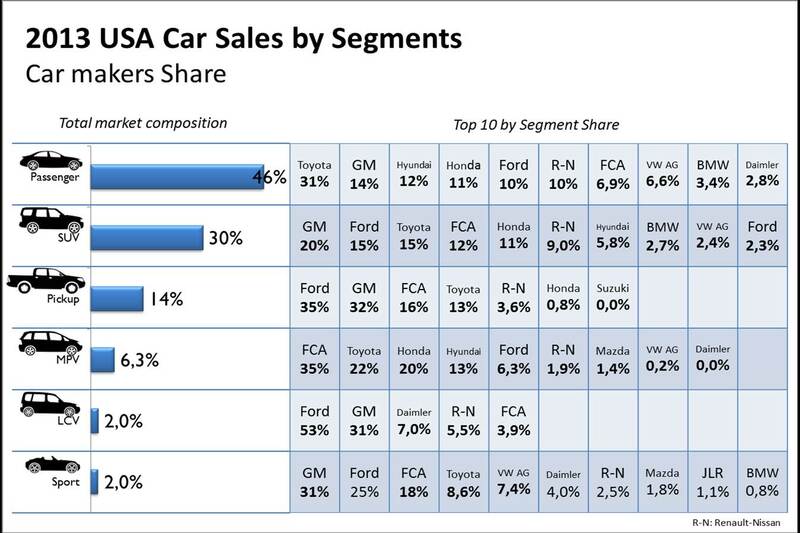 Notice the bad position of FCA, outperformed by Nissan and even Hyundai. 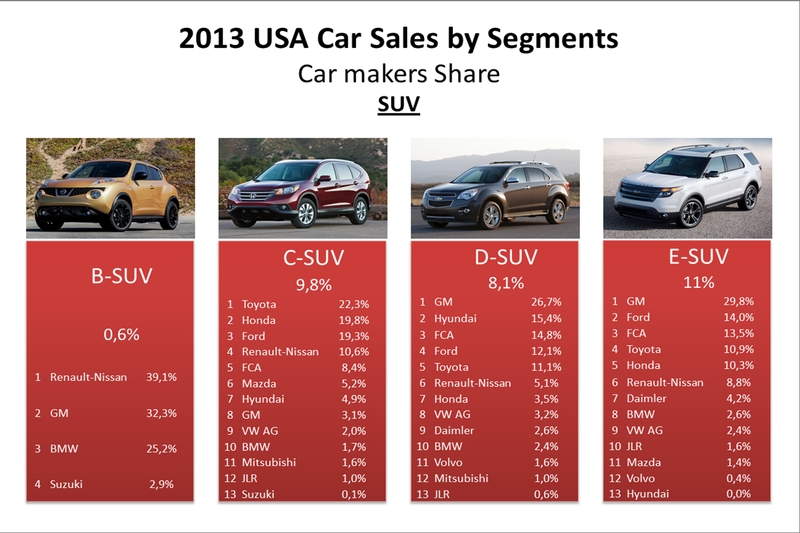 In the SUV segment, the situation is more balanced as the 5 largest car makers control between 10% and 20%. VW AG controls only 2,4% of this important segment. 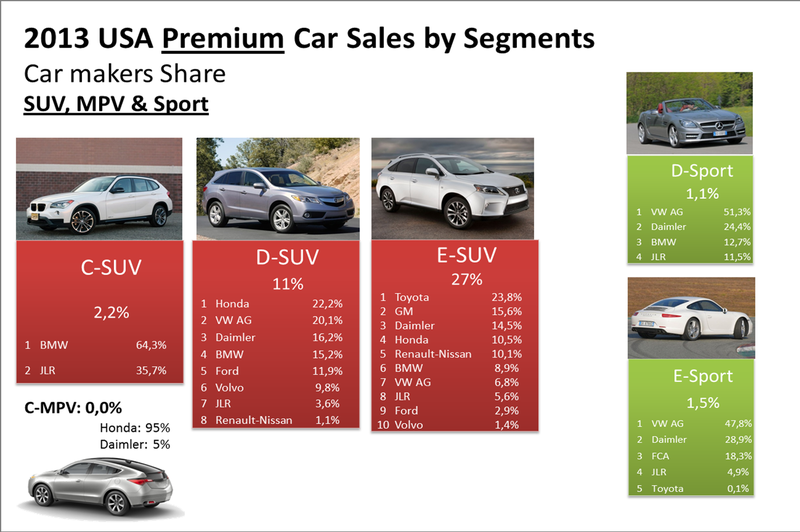 Premium segment counted for 12% of total sales, which is a bit lower than the share this kind of cars have in Europe. Germans outperform Americans in D and E segments, but not in the F one due to Cadillac division. The premium segment is mostly composed by large SUVs and Toyota clearly dominates thanks to its Lexus range. Mercedes is another important player. In the sport segment, VW range leads mostly because of Porsche. 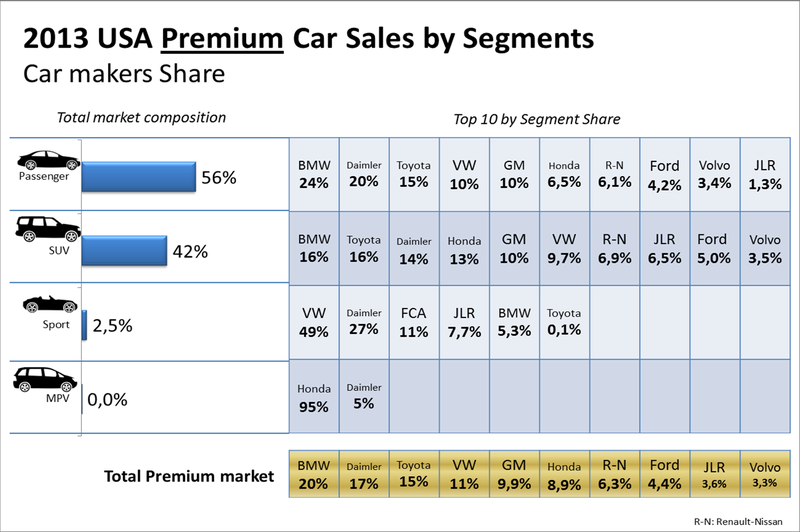 As it dominates in the passenger and SUV segments, BMW leads the premium segment in the US, ahead of Mercedes, Lexus and Audi. Cadillac, Acura, Infiniti and Lincoln come next. 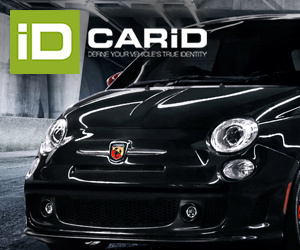 ← The other side of Fiat brand: a low-cost range?